The Proto IITM Wall System demonstrates simplicity of design achieving efficiency and strength. 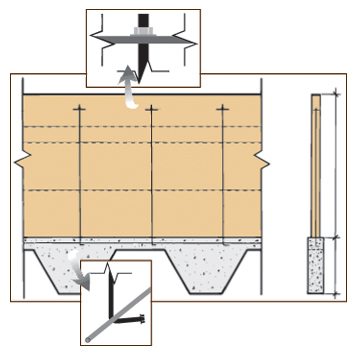 Wall compression attained from specified post tension forces creates outstanding structural integrity; stronger than conventional masonry, yet with the ability to flex without failure under code specified wind and seismic loading. The basic Proto II system consists of high strength steel tension rods "L"-hooked under a single rebar in the footing, a 1/4" steel plate washer, direct tension indicator and tensioning nut, and joint reinforcement at specified locations. Walls over 6 feet in height may have additional requirements. 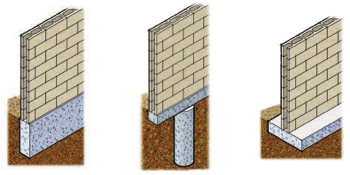 Four footing types accommodate a variety of site conditions: Dip Footing (shown in diagram), Trench Footing, Pier Footing, or Spread Footing. Cmu conforming to ASTM C90 are used in the construction of Proto II, so the completed wall will look like traditional cmu walls in every respect, including available face textures in precision, split, burnished, shotblast, and SlumpstoneTM. Standard Proto II footings in Dip Footing or Trench Footing design meet the 5' to daylight requirement without increased footing depths or buried block – first course is at or near grade. The amount of soil displaced can be one-third to one-fourth that of conventional footings with a corresponding reduction in concrete volume, resulting in significant savings. 6" wide retains up to 3 feet with 6'-4" Proto II wall on top. Engineering is also available for conditions that exceed the base design, including combinations of retaining walls for lower courses and Proto II for upper courses. 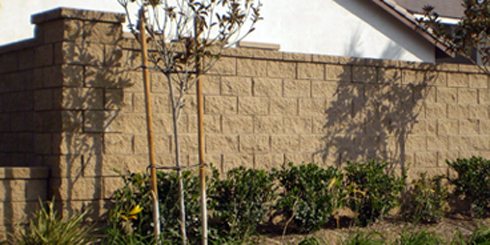 The fence wall designs referenced are offered as a courtesy to licensed contractors and building professionals. It is the responsibility of the user to verify the Design Criteria are appropriate for a specific project under consideration and are approved for the project by the governing agency. Proto IITM fence and retaining wall designs and details are the products of licensed professional engineers as noted on each Proto IITM Wall Systems detail. Proto IITM Wall Systems are installed by authorized contractors only.